The first twenty minutes or so of "Bajatey "Raho" are a bit of a roller coaster in terms of the expectations they set up. What at first appears to be a man (Tusshar Kapoor) pleading with a school's headmaster to allow his younger, video-game obsessed relative (Hussan Saad) into the school is then revealed to be—delightfully—the guy and the kid setting up a wildly elaborate blackmail scheme against the headmaster, which then turns into a car chase with the gun-wielding headmaster. Then what's really going on finally becomes clear: the headmaster isn't even the target at all, it's his boss, crooked industrialist Sabbarwahl (Ravi Kishan). The protagonists—a tight-knit family and a couple friends—are out to avenge their patriarch, a kindly, honest soul who started a bank for the poor and working class in their Delhi neighborhood, only to be swindled by the industrialist, and left over a billion rupees in debt to the furious community. The shock kills him, leaving his loved ones to somehow get the money back before they lose their house. And so, they decide that since Sabbarwahl has stolen it from them, they're going to steal it back. 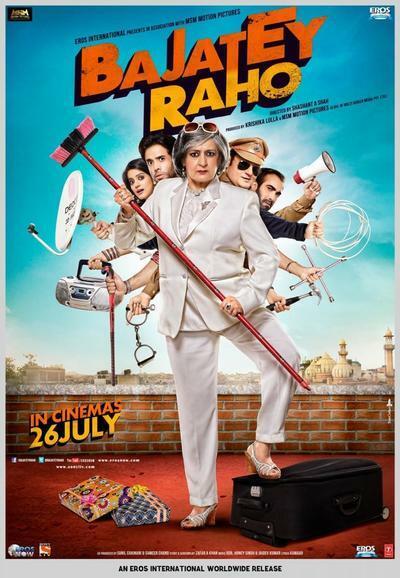 "Bajatey Raho" is an energetic, irrepressibly good-natured caper comedy, and a concise one, clocking in at under an hour and fifty minutes. It elides some details (a lot of the character relationships are a little unclear, and certain particulars of the long con the protagonists run on Sabbarwahl don't hold up to any scrutiny) but manages to plow through most of them with bonhomie and charm. One obstacle it can't quite get past is the integration of the love interest. The character of Manpreet (Vishahka Singh), although she goes on to become more than just "the love interest" in terms of importance to the greater plot, isn't handled terribly well. She's introduced as a random pretty girl Sukhwinder (the above-mentioned Tusshar Kapoor) encounters in his daily business as a cable TV installer, and with whom he subsequently has a tuneful, slickly shot montage of dates. Suddenly, though, it's revealed that she's a choreographer substituting for her friend who was supposed to arrange a production number at Sabbarwahl's daughter's wedding. The scheme to take Sabbarwahl down (that hinges, crucially, on the wedding) appears nearly seamless, in the classic con/heist movie tradition, except for the elements involving Manpreet. Nearly every one of her contributions to the greater scheme, although successful, appear to be completely by chance. She's ultimately a reusable deus ex machina. This doesn't sink the movie, by any means, but business relating to her character accounts for the vast majority of the narrative and logical loose ends. Shashant Shah is a director to whom logical loose ends are relatively low on the list of things to fix, though. His previous two features, "Dasvidaniya" and "Chalo Dilli," featured, as does "Bajatey Raho," premises that operate more on the emotions than logic. "Bajatey Raho" shares two primary things with Shah's previous work, that sentimental streak and actor Vinay Pathak, who appears here as the master of disguise who helps facilitate the scheme, and is effective until he disappears almost entirely by the climax. By then, there are so many different plots to resolve that a few fall by the wayside, with most coming to satisfactorily cathartic fruition. "Bajatey Raho" isn't bad at all, and it's quite fun if one doesn't stop to think too long and hard about it. The songs are good, the cast is enthusiastic, and there are some very funny bits of business in it. On the other hand, it unravels fairly quickly if one starts pulling threads. This is never a terribly wise thing to do in a comedy, whose main priority is to be funny. "Bajatey Raho" is, rather, and never in a mean way, which should count for something. Not anything profound, but something.